The Mobile Warming Geneva Heated Textile Glove is the perfect wind and waterproof solution for any winter sport enthusiast. Stay warm whether you�re cruising on your motorcycle, skiing down the slopes, or relishing in any other winter sport. The integrated 7.4-volt heating system is powered by light-weight, rechargeable Lithium-Ion batteries. Feeling chilly? Effortlessly adjust heat on-the-go with the push of the easy-access control button. Four heat settings ensure you stay warm and comfortable for up to 10 hour. Whether you are a motorcycle rider, skier, or a passionate outdoor enthusiast, the Mobile Warming Geneva Heated Textile Glove is the perfect solution to keep you warm and dry in winter conditions. This exceptional glove is made from our uniquely durable and light-weight 500D Poly-Oxford shell with Windshark� technology for wind- and water-resistance. With a reinforced palm for durability, you�ll enjoy comfort while gripping handle bars or ski poles. 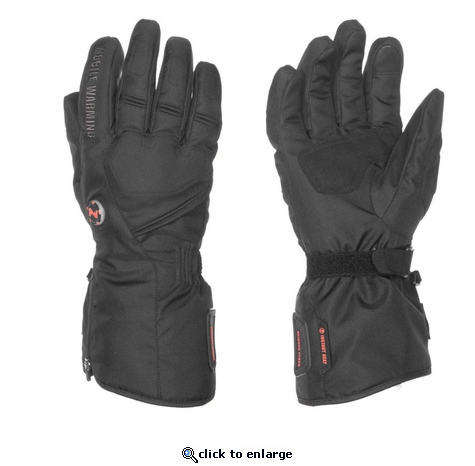 Say no to snow�in your gloves�with Geneva�s gauntlet-style design, adjustable hook-and-loop wrist closure system, and lightweight Rainguard� waterproof liner. Plus, the Geneva Mobile Warming Glove�s padded knuckle and built-in touchscreen compatibility means you can stay in contact without the need to peel off wet gloves. Integrated heating panels keep you warm and comfortable. Need a temperature adjustment? No problem, just use the integrated in-cuff touch button controller. Choose from four different temperature ranges to ensure you�re at the perfect comfort level. Two powerful, light-weight 7.4-volt Lithium-Ion batteries on each cuff allow you to enjoy added warmth for up to 10 hours. Ordered the above item, but could not get one of the gloves to work Called in,had a long conversation with Robert, who led me through tests concluding that one was defective. Went through procedures to send them back for exchange. Received replacement gloves quickly with no performance problems. Overall helpful and knowledgeable excellent customer service. I have large hands so ordered the XXL. They were too small. my dad has these and i just bought a pair for myself!